2,4-D (2,4-dichlorophenoxyacetic acid) is an herbicide used to control broad-leafed weeds in crops, lawns, pastures and forests, and to control aquatic weeds. It has been widely used since its introduction in the late 1940s, and made up half (the less toxic half) of Agent Orange, the controversial defoliant used in the Vietnam war. 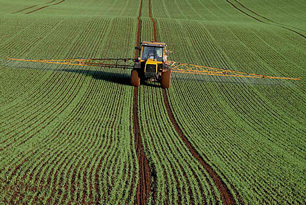 A 2009 report from the Washington State Department of Agriculture lists it second among the top five waste pesticides, first if you don't include “hazardous waste not otherwise specified”. A 2007 estimate by the EPA ranks it number one in home, garden and industrial use. It ends up in drinking water primarily through agricultural runoff. Some people who drink water containing 2,4-D in excess of the maximum contaminant level [0.07 milligrams per Liter] over many years could experience problems with their kidneys, liver, or adrenal glands. The EPA recommends granular activated carbon (GAC) for the treatment of 2,4-D.